Nutrex, a leading global supplier of top quality feed and flour milling additives, will be present at the 2018 International Production & Processing, IPPE, in Atlanta, Ga. USA, from Jan. 30 - Feb. 1, Hall C 2554. 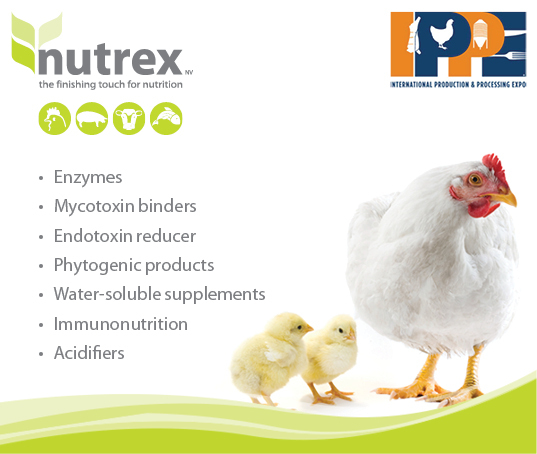 During this event, Nutrex will be presenting its health and nutritional solutions for poultry such as enzymes, mycotoxin binders, yeast derivates, slow release acidifiers among other. Nutrex will welcome all customers and interested parties at the booth 2554 Hall C.